I have heard these two words uttered in English, Spanish, with a southern accent, by a salty sea captain in the Gulf of Mexico, and many others commenting on the moment when fish and fly or fish and bait meet. This week my husband heard those words when a North Carolina Red Drum took his fly and ran. 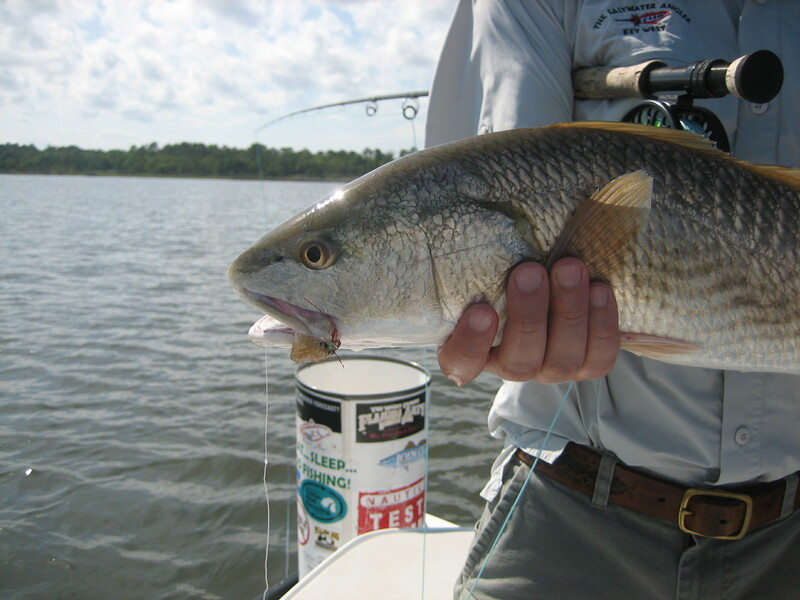 For the recreational fisherman, the goal is not to catch the most fish. It is not necessarily even to catch the biggest fish. Instead, the goal is to spend a day in communion with creation, where fish and man meet, say hello, then goodbye, and both are changed from the interaction. The communion with nature and fish is real and lasting. I see the effect when my husband returns home from a day of trout fishing in a western Virginia mountain stream. Placing a small, colored, artificial bug in such a way on the cold clear water that a brook or rainbow trout would strike is nourishing to him. The connection to the particular place is often more fleeting, however. When we travel, we drop into others’ worlds, and then move on. Though our outdoor travel experiences give us great joy, they often lack the connection to place that we gain from fishing our home streams, or hiking or favorite local trails. Fish on, then release, and then we plan our next trip that will involve fishing somewhere new and wonderful. This week however, my husband and his father had an opportunity to get more than just the passing glance at a new place, and much more than the isolated and fleeting “fish on” experience. What started as a fairly standard guided fishing trip, ended up becoming an opportunity not just for them, but also for our whole family, to learn more about the place that we have visited many times before. Whit and his dad hired Captain Seth Vernon for a half-day’s fishing trip in the waters off of Topsail Island, North Carolina. Seth was an outstanding guide, to be sure (as evidenced by the picture below), but he proved to be an inspiring advocate for his home waters. After close to five hours with Captain Seth, Whit and my father-in-law had fish stories and the usual smiles and pictures to go with them. What made this trip different, though, was the fact that they talked more about what they’d learned about the place where they fished than the fish they had caught there. A good guide helps you catch fish, but someone who inspires a connection to the place separate and apart from the fish is truly unique. 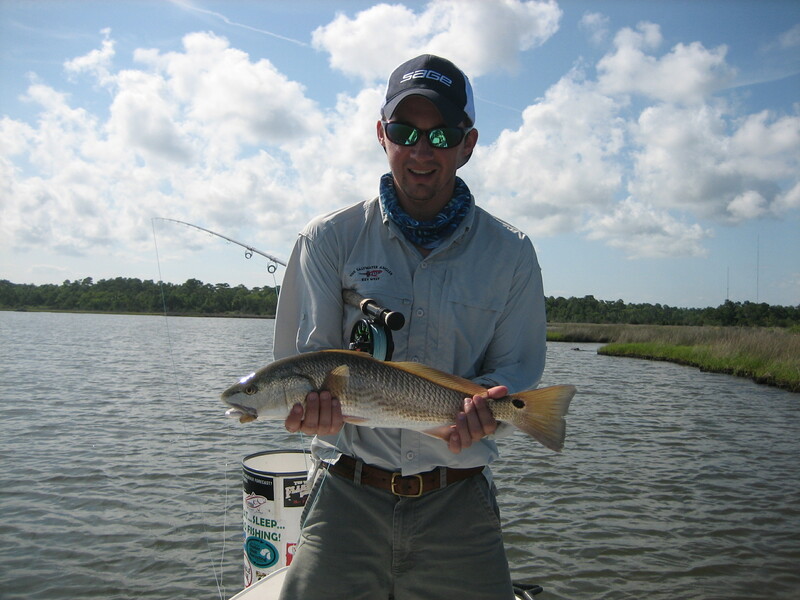 In the coming weeks I will have a lot more to say about Captain Seth Vernon, the Red Drum, and the many issues that surround fishing and coastal preservation in eastern North Carolina. In the meantime, if this has piqued your interest at all, check out Captain Seth’s website at www.doublehaulguideservice.com. Please also check out www.redfishcantjump.com to learn more about a great film (that I will also write about more in the future) advocating for the preservation of North Carolina’s Cape Fear coast and North Carolina’s state fish, the Red Drum. PS – Thank you Whit for helping share your love of fishing and your introduction to Captain Seth this week.